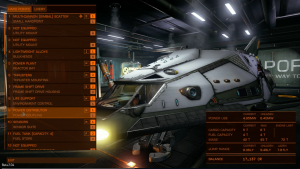 Following on from my previous write-up that The Guardian ran about my experiences with Elite: Dangerous from the first premium beta round and up to beta 1, here’s a similar look at where I’ve got to with beta 2 so far. 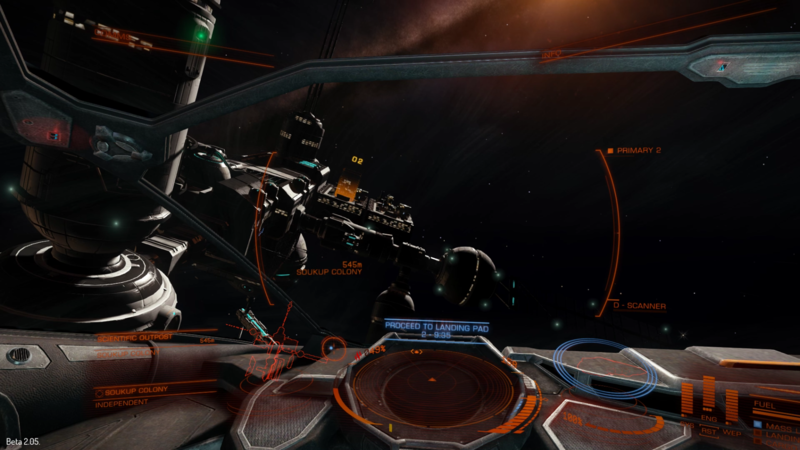 Frontier Developments initially released beta 2 late on September 30th / early October 1st, but it was after a couple of days (and nights) of frantic work by the devs that we had a stable version to play with. We’ve also seen some tweaks to existing mechanics, of which the one that introduced the concept of drag, and therefore deceleration, in newtonian (flight assist off) mode has been decidedly less popular with beta players. It was implemented to re-balance gameplay such that it became impossible to hit boost and then cruise at beyond normal maximum speed thus simplifying an escape from an assailant. The change I felt most with my trader/opportunistic-bounty-hunter play style was the reduction of profits that can be extracted from the commodities markets. There are still some sweet spots that let you turn a profit but with far more moderate returns than all previous builds. Also, Slopey’s BPC tool has been blocked so it’s back to pen and paper to record those routes and stocks. As mentioned, the extensive changelog included, among other things AI mods for NPC ships. As yet I haven’t run into any AIs that feel significantly different from before but the devs say that the lower level AIs have been made a little softer while the higher levels have been ramped up a bit, specifically in terms of their apparent aggression in a showdown. So how have I spent my first two weeks in (which is potentially the first half of) Beta 2? Well, the full reset meant going back to a Sidewinder with 1000 Cr. In fairness, the devs did explore opportunities for a partial wipe, but explained that it would be far better to clean everything out if we (the players) didn’t mind. They asked for an opinion from us via the Elite forums, to which we responded almost unanimously with an overwhelming ‘Yes’, before going ahead. 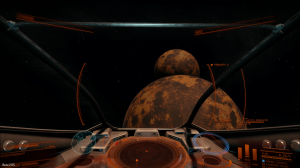 So, back at square one, with all that work to do again, I found myself docked at Azeban. 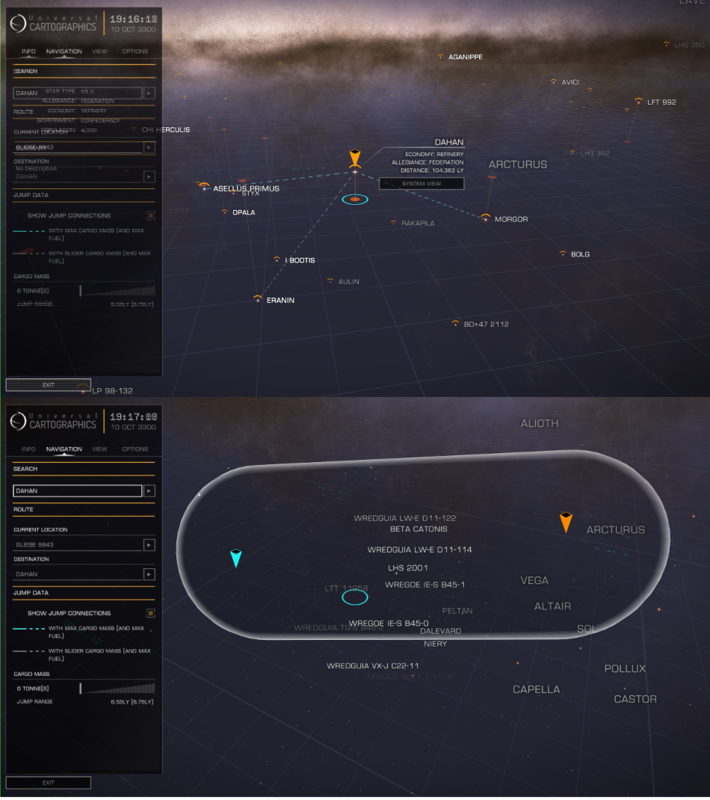 Having had a quick check around to make sure the menus were where I expected to find them, and the controls were still how I had mapped them, a quick look at the Galaxy map. Wait, what’s this? 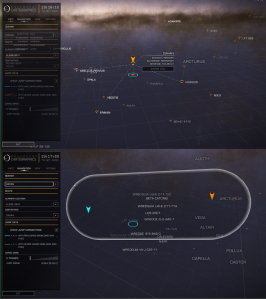 There’s a System map too. That’s interesting, and I want to check it out but first… let’s return to the surface! Yes I’m impatient, but I’d heard lots of things about how much nicer everything looks, and so here we go. The lift starts to cycle, we’re going up and… I’m not at Azeban. At least not the Azeban I remember, this is Azeban Orbital, an outpost, and – wow! – there’s a planet, and it’s beautiful. It’s all blue, and glowing and BIG. And there are the stars. Seemingly all of them, all at once. 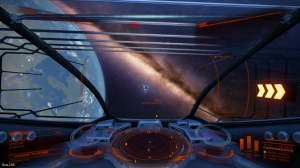 This platform is just a tiny refuge in the vastness of space. A fragile place. 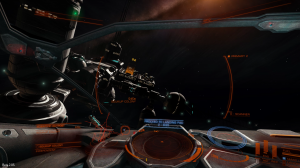 Not at all like the behemoth stations of Beta 1, oh no. All this and I haven’t even actually launched yet! 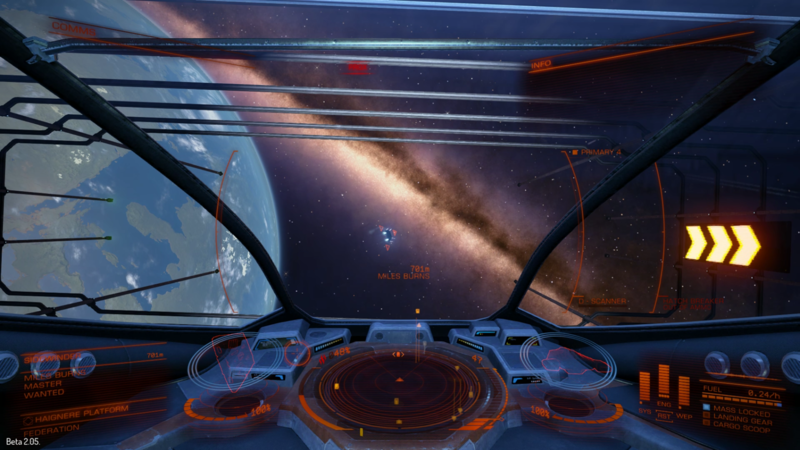 One thing Elite: Dangerous has never failed to deliver from the first time I got my hands on the premium beta, is a breathtaking experience. If I’d had an Oculus Rift headset on during that first ride to the surface of the Azeban Orbital, I think it’s possible I’d have been fighting off a spell of hyperventilation. Anyway, having realised pretty quickly that, despite the improved, more intuitive galaxy mapping and jump range indicators, the old style of trading was going to be non-starter for me. So I began by just exploring, picking up jobs from the bulletin boards and wandering around, basically without any preconceived plan. Surprisingly quickly though, the credits started to roll in. A few thousand here, some more there. A bonus bounty or two, and before long I was back at the controls of a Hauler, which, as in Beta 1, allowed for a slightly faster accrual of credits as you can take on larger haulage contracts. Pretty soon I had enough cash to drop in for some refitting, and this is the second area where significant expansion has been delivered in Beta 2. We can still swap out our loaned lasers, add others, or missiles, or projectile weapons as before, but there are a lot of new odds and ends to explore too. Maybe you want to sacrifice some cargo space for bigger fuel tanks or a Field Repair Unit. You could beef up your Frame Shift Drive to gain extra jump distance, or bolt in a Cargo Hatch Disruptor Limpet to make your pirating life that much more entertaining. Whatever floats your boat, you’ll find lots of ways to soup up (or cripple, be warned) your ship. The first upgrade I bolted to the Hauler was of course a hefty gimballed cannon. Relatively low power consumption, and high impact, but purchased more for defensive rather than offensive action. During this spell of configuration investigation, I thought I’d try to eek out slightly more credits-per-contract from my trusty Hauler by extending the cargo racks for a little extra tonnage and adding a bigger Frame Shift Drive (hyperspace motor) which I did, no problem. But then after filling up with haulage cargo I discovered after launch that I had become permanently mass-locked, and couldn’t ever engage the FSD. Returning to the station I also discovered that I couldn’t restore everything back to its original state, so I ended up having to dump all the cargo I was carrying (potentially damaging my reputation as a haulier) and downsize the bigger cargo rack. 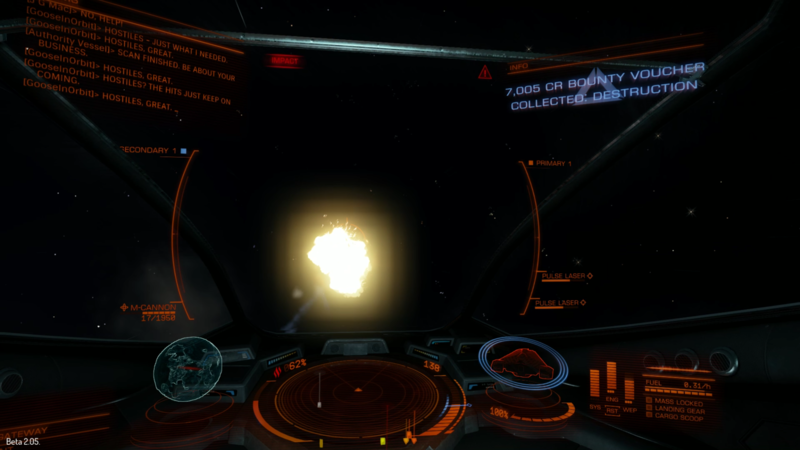 That at least got me frame-shifting again, and I still had a slightly better jump range out of the new FSD. At this point I decided to set off on a quest to explore the furthest reaches of the playable area of our Milky Way galaxy. 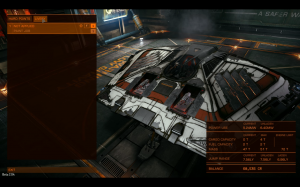 I was a little more confident with this after trying it out in my Sidewinder almost as soon as this build was released, to the point where I completely ran out of fuel just to see what would happen. After all, it was a free Sidewinder so who cared? It turns out that a “passing ship” was available to replenish my depleted fuel stocks and get me going again. This is great, but much like the terrestrial equivalent of roadside recovery, costs a small fortune. At the time of writing, I’m located in the HIP 2422 system all the way over on the far side of the capsule-shaped playing area. I’m mainly fetching and carrying between here, Poqomathi and Gliese 9843. These remote systems still have quite lively bulletin boards though so there are some credits to be made here while I’m working out whether to stick around or strike out in search of bigger payouts. In terms of population, it’s very quiet out here and as yet I don’t think I’ve seen another human player. 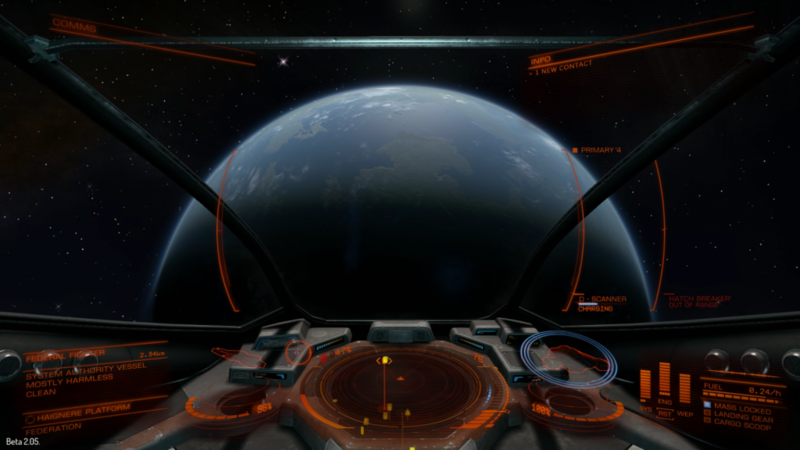 There are quite a few outposts and ‘unknown’ stars and planets so a good deal of exploration opportunities await. On the way over I dumped the Hauler as soon as I had enough credits to buy a Viper, in which I had gone in search of light cargo runs and bounties, and scored a couple of wins before upgrading again to a Cobra, which always feels like home somehow. The bank balance is still considerably less than it was at the end of Beta 1 but it’s slowly building, and I know where to find an Asp when I have six million credits spare. That’s only 60 times my current balance! 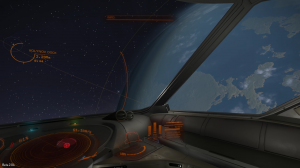 In the meantime, it’s still an immersive and satisfying experience just flying around, doing the odd job here and there and gradually upgrading the ship again until it’s time to set off to find even more distant and wondrous places. visuals and fluidity thereof. The way a planet’s atmosphere glows around its circumference as you approach from the dark side, the rendering of terrain and oceans and clouds seen from the light side, and the high contrast play of light as you arrive and leave the outposts in brilliant glare or intense darkness, all comes together to throw ultra-believable scenes on to your monitor or better still I’m guessing, the Oculus Rift. All the ships have been given an art makeover and look fabulous. For a while. The new wear and tear effects get to work as soon as you take your new ride out for the first time, and it appears the vacuum of space is actually pretty abrasive. Must be all that friction generated by hyperspace travel. In no time you’ll find that it’s looking a bit tired and in need of some repairs. I don’t know yet whether 100% wear will result in a catastrophic failure or not but I don’t think it’ll be long before I find out. I’m still wearing a “Harmless” rating, and I haven’t yet had to call on the services of a money lender to cover the cost of insurance but I hope the former condition will change before the 28th of October and the release of Beta 3, while remaining blissfully ignorant of the latter. 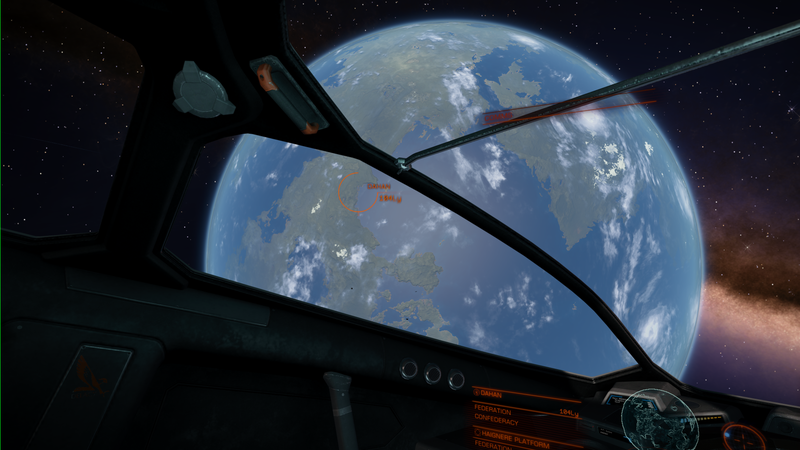 It’d be interesting to know what real-life astronauts have to say about Elite: Dangerous, but my guess is that they’d be appreciative of its visuals, while possibly hoping that our species’ migration to the stars plays out a lot like this game. Frontier, you’re doing a fantastic job. Roll on Beta 3! I’ll add some more interesting links here or elsewhere on the blog, so keep a look out for those to appear soon. Edit: I had incorrectly remembered the name of the starting station and said that it was Dahan. In fact, Dahan was my first destination after Azeban, and although I remembered the impact of seeing the big, blue planet hanging in space before me, I hadn’t kept accurate notes as to the name – apologies.